Cape Range National Park is right next to Ningaloo Reef and was where we camped whilst we were visiting Ningaloo, but it was terrific in its own right and had absolutely stacks of wildlife. It was really interesting as there was a bore water tap in a pretty dry area and on our first day we went to the tap to fill up a jerry can with water so we could shower after snorkling. We have a shower connection through the engine of the car and so can have lovely hot showers. Anyway at the tap were a mob of about 15 emus so we ran the tap for them and took loads of photos and some video of the results. 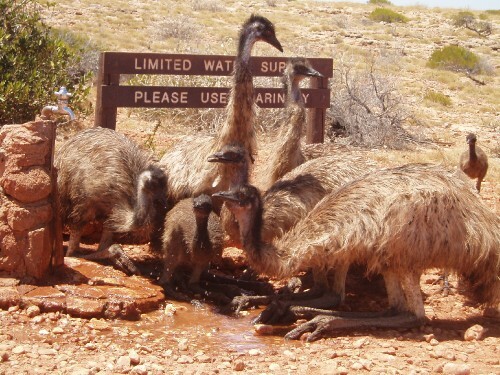 We went back to the tap on our way home at dusk and the emus had been replaced by kangaroos and again we made a pool of water for them to drink from. So you can guess that we went via the tap every day to see who we could help drink and there was always animals waiting there. We also saw lots of animals away from the tap - they didn't stay there all the time obviously and saw quite a few emu dads and their babies. Mums don't look after the young - after they lay eggs the dad gets all the work raising them. Again there were plenty of lizards and some quite amazing white crabs that scuttled all around our tent after dark - it was entertaining watching them.